Despite growing competition from other tablets, Apple's iPad still accounts for a whopping 89.28 percent of e-commerce website traffic, and also rakes in more money on a per-user basis than any other platform. 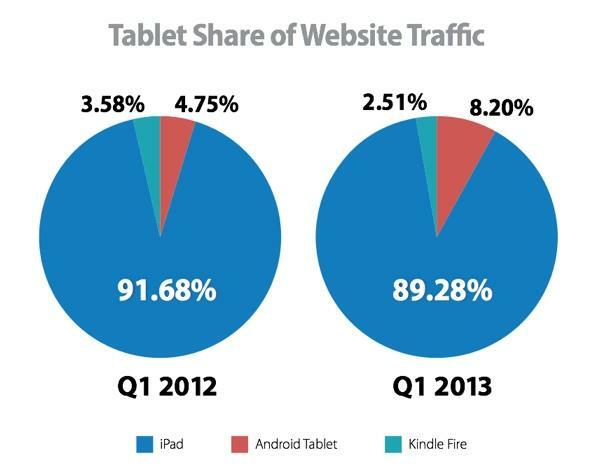 Source: Monetate Ecommerce Quarterly report for Q1 2013. The figures come from Monetate's latest Ecommerce Quarterly report issued on Wednesday and provided to AppleInsider. The data culled from the first quarter of calendar 2013 shows that Apple's iPad still accounts for nearly 9 out of every 10 tablets that browse e-commerce websites. Apple's still-dominant share is down slightly from a year ago, when it commanded 91.68 percent of e-commerce traffic. Gaining presence were Android tablets, which grew from 4.75 percent a year ago to 8.20 percent in the first quarter. Interestingly, Amazon's Kindle Fire lost traffic share among online shopping websites over the last year, falling from 3.58 percent to 2.51 percent. When it comes to how much money tablet users spend, Apple's iPad is also the leader, with an average order value of $99.05. 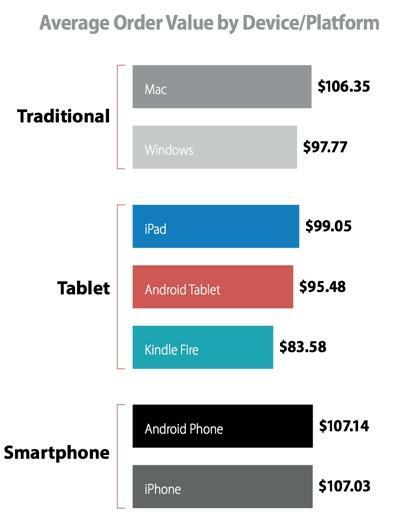 Android tablets took second on a per-order basis, with $95.48, while the Kindle Fire came in third with $83.58. The data shows that not only are iPad owners more likely to shop on the Web, they also spend more money, on a per-person basis, than competing platforms. The figures are from a random sample of more than 500 million online "shopping experiences" tracked by Monetate, whose clients include Best Buy, Frontier Airlines, Aeropostale, The Sports Authority and PETCO. The use of tablets for online shopping is also surging, growing from 5.95 percent of e-commerce traffic in the first quarter of 2012 to 10.58 percent at the start of 2013. Tablets remain slightly more popular than smartphones for online shopping, as handsets accounted for 10.44 percent of e-commerce traffic. Traditional computers still account for the lion's share, with 78.99 percent in the first quarter of 2013. Among traditional computers, Mac owners also spend more per order, according to Monetate, with an average purchase value of $106.35. Windows PC users spend an average of $97.77 per order. No breakdown of OS X vs. Windows e-commerce traffic was given. Finally, among smartphone shoppers, Google's market leading Android platform was the most profitable on a per-purchase basis, accounting for an average of $107.14 per purchase. That was slightly more than Apple's iPhone, with an average of $107.03 per e-commerce order placed. Like with Mac vs. PC. Monetate's data did not break down traffic from Android and iPhone smartphones, so it's unknown which platform sees more overall e-commerce shoppers. Though Google's Android currently accounts for 75 percent of smartphones shipped, Apple's iOS still leads in terms of browser share usage, suggesting that iPhone and Android owners use their devices in much different fashions.